Can Psychology Ignore Further and More Compelling Data on the Human Behaviour, Mind, Personality, Presented by Other Sciences? Can Psychology be an Adequate Science of the Total Human Individual? The indisputable fact that Man is more than his behaviour, or his mind, or his total personality, involves psychology in issues which it cannot explain or resolve unless it derives aid from the knowledge delivered by the best operations of human reason and other cognate capacities of cognition. Limitations of the Sense-Evidence, and the Declarations of the Higher Consciousness. The higher observes the lower the unconscious is controlled and transformed by the conscious; the conscious is controlled and transformed by the superconscious which bears in its being the Supreme Reality. What Impels our Search for God? By the vastness of its extent, the enormity of its achievement, - and the manner of its invasion of, and the patterns of the influence it has sought to exert over, general human life and conduct, - the scientific psychology renders requisite and exigent a revaluation of its central conceptions, and a determination of the scope of its inquiries and the limitations of its techniques. Envious of the independence obtained during the sixteenth and seventeenth centuries by astronomy, physics and chemistry, and by biology in the eighteenth century, psychology, too, sought and (during the close of the nineteenth and the beginning of the twentieth century) succeeded in seeking for a similar status, in the interest of its own development and to the damage of philosophy. It is with the dawn of the scientific age, the development of the empirical approach to knowledge, the growing respect for factual material, the emergence of the scientific method, the rapid rise of the biological sciences and the more rapid progress made by the German physiologists like Weber, Fechner, Helmholtz and Hering, and the systematic efforts and the consequent achievements of the structuralists Wundt and Titchener, the functionalists Dewey, Angell and Woodworth, the psychoanalysts Freud, Adler, Jung and Horney, the behaviourists Thorndike, Watson, Pavlov, Hull, Spence, Skinner and Tolman, the Gestaltists Wertheimer, Koffka, Koehler and Lewin, that psychology sounded fully its trumpets of triumph as a full-grown independent science and set out vigorously on a dynamic experimental career. The time, then, is ripe for pausing a little, not merely for understanding sympathetically its aims and aspirations, but for examining critically its procedures and its results and revaluing its central concepts, only to point out such modifications in its moods and its methods, such relaxation of its narrowness, and such expansion of its search for knowledge, as would help psychology serve human progress and welfare in a manner that is in conformity with the eternally true lines of the evolutionary genius and progression resident in, and presiding over, the processes of the mind of mankind. Any objective and impartial judgement would accord an earnest and enthusiastic appreciation to the founders of the different schools of modern psychology. But, that appreciation would be addressed to the labours involved in their untiring researches, to the unusual zeal and tenacity of purpose they have exhibited in their efforts at extending the boundaries of human knowledge, but not unreservedly to the results of those researches, the intrinsic value of that extension, the fields of study they have departmentally demarcated for themselves, the methods they have employed, the conclusions they have reached, and never at all to the temerity with which they advance their case, assert their 'truths', and disseminate their views. A double movement and a twofold purpose are implicit in this task - a continued examination of our own position in the light of their findings, and a continued revaluation of their leading conceptions from our standpoint, which will help them see their results in all their implications and in their full significance, pursue their arguments to something like a final unravelment, and perceive a number of fundamental problems of human mind that are precluded from their purview. On account of their commitment to a narrow field of survey and their bias in favour of their subjects and the validity of their techniques, many basic issues of mind are excluded from their study. It also helps us burnish for humanity the gold of its own eternal, all-dynamic, and all-comprehending Wisdom. We neither entertain any intention of seducing modern psychology into the field of philosophical speculation, nor maintain with Croce the impossibility of any empirical psychology. However, we do try to disturb the self-complacency of the scientific psychology and declaim its tacit, or open, denial of any thing which has not yet yielded itself as an experimental fact. Furthermore, we declaim its unscientific readiness to jump to dangerous conclusions on the strength of the poor and mistaken data whose only merit consists in their amenability to experiment and observation under controlled conditions, and encouraged by the results ensuant as a reward for the laboured efforts thereon. Also, neither wisdom, nor any real scientific spirit devoted to the true advancement of human knowledge for human welfare, can acclaim the wide and unrestrained dissemination by scientific psychology of its own assumptions, postulates, conceptions, as though they were eternally valid and true findings of scientific research. No man is a simple unit, and no science of man can assume or claim to constitute him into a scientific subject of true and adequate study, unless it takes into the field of its investigation and dispassionate and objective inquiry and knowledge, at least the most indispensable elements from the body of knowledge presented by the data painstakingly collected and researched by other sciences. The human individual is a structure of multiple dimensions. Man is at once a physical embodiment, a mental phenomenon, and a spiritual entity. He has to appease not only the hunger of the body, the thirst of his vital urges, but has to pay an equal, if not greater, attention to the demands of his psychic nature, his moral tendencies and his spiritual aspirations. No secular science can, therefore, confidently affirm that it knows man fully, and this limitation of knowledge on its part limits its utility, meaning, significance, value. This fact enforces on any sound scientific and valuable psychology, the obligation to draw further data from the higher insights into the phenomenon of man embodied not only in the social, mental and secular sciences, but also in the perennial philosophy and spiritual experience of the world's timeless cultures. To liberate psychology from such a necessity, or dependence, would be to destroy the very soul and sustaining vitality of psychology. Science of the Total Human Individual? Psychology can neither claim to be, nor call itself, the science of the total human individual. By its very nature, spirit, aim, function, it does not include in the scope of its study, experiment, explanations and guidance dozens of the most fundamental factors implied in human experience and involved in the most complex and subtle operations of the human consciousness - which is, contrary to the contention of modern psychology, independent of the brain-mechanism, though the brain-mechanism is indispensable for its objective, physical and sense functions, expressions and experiences. Only an uncritical, dogmatic, partial, and misleading view, however helpful it be in other directions, can assume, or advocate, the idea that man is nothing more than a psychological organism founded on, and emergent from, or acting through, the physical basis. Inexorable logic renders it impossible for reason to escape the truth that, above all, man is the all-inclusive, yet all-transcending, metaphysical principle without which there can be no physical life, or psychological functions, or social behaviour and experience. Psychology is a partial science, and therefore has to be humble enough, not only in the interests of true and more adequate knowledge concerning man, but also for purposes of advancing human progress, and be content - until it grows up to be a more mature, broadbased, integral, and therefore more helpful and serviceable system of knowledge; to be a science complementary to such dynamic philosophies of life which have for millennia securely guided human evolution on an individual scale. The sustaining vitality of psychology lies in its inner relations with the timeless scientific philosophy, and with the general techniques of universal spiritual experience and knowledge. In daily human experience and life, man encounters realities for which psychology has no true and valid explanation, and meets illnesses of mind which psychiatry does not know and cannot cure, - even as there are thousands of medical cases which the medical experts openly acknowledge as being beyond the ken of their knowledge and means, and then consign the patients to their fate with a label stuck on their coats, 'incurable', 'beyond cure', 'we don't know'; and where they do know it, one expert differs from the other in diagnosis and treatment. It is here again, that psychology is humiliated, and can recover its dignity only by a bold and fresh investigation of the fields of higher knowledge concerning the phenomenon of the human consciousness and behaviour. And what is Consciousness? Psychology does not know, but to save its own face attempts quite childish, spurious, unscientific, logically unsound, experimentally unacceptable explanations. This central and constitutional weakness of psychology infests its entire structure with glaring flaws. And those who are intellectually gifted and culturally advanced look for data on the nature of the most fundamental functions of Mind and Consciousness outside the field of modern psychology. In its unnatural struggle to be an objective science, psychology distorts itself beyond recognition, limits its aims, purposes, functions, nature, utility. Growing and progressive in one direction, it is atrophied in all other directions. However, the future of psychology is glorious, more glorious than its past. New trends and tendencies will appear, and redeem psychology from its present limitations which are sapping its central strength and vitality. Naturalism is doctrinally quite dogmatic in its denial of all evidence for a universal teleology, for the derivation of the world-process from a transcendent source, and for the dependence of the cosmic manifestation, - in the unity, order, harmony it reveals, - upon an upholding and governing spiritual principle. With its central affirmation of the adequacy of the idea of matter in motion as accounting for all phenomena and embracing the whole of the reality, naturalism is committed to reduce all things to mechanics. It is obliged not only to stress its concepts of causal determination and the laws of nature, but also to carry mechanical necessity all through experience, and apply that mechanical necessity even to the most complex workings of nature, of living organisms, of the creative activity of human genius. Naturalism treats everything as purposeless and deterministic, rejects freedom as meaningless, free will as a delusion, ideals as artefacts, moral judgements as conventional, and immures man in the mechanical prison-house of a dreadful fatalism. Reason compels us to confute the verbal challenge naturalism presents to the cogency of the cosmological, teleological, and moral arguments. four, that the ethical values, activities and restraints rest upon, and are justified by, teleological and axiological grounds, and that by reason of a different order of reality and awareness to which they belong, they can be neither approached, nor explained, from the standpoint of naturalism, mechanism, materialism. b) man's direct awareness of the capacity his will owns, as a fundamental fact of his consciousness, of exercising an appreciable control over, or changing the conditions and courses of, phenomena. Naturalistic epistemology entrenches itself in a simple absurdity by restricting all our knowledge to so superficial, extrinsic, and circumscribed a field as the one constituted solely by natural events and the relationships holding between them. It regards consciousness, the percipient individual, as a derivative, secondary, and almost negligible, phenomenon. As the substantival basis of all awareness, the experiencing subject, the percipient individual, the central consciousness enjoys the supreme ontological status, and is the one presupposition of all knowledge to which all objects appeal for their revelation and reality, in which all that we experience has its source, and by which matter itself is illuminated and made known. In spite of this invulnerable fact, naturalism reduces the experiencing subject to a status inferior to the experienced object, and resolves mind into matter. Thereby it surrenders itself to mistaken principles and misleading assumptions. As a philosophical theory, it cannot consider any notion of the autonomy of the spirit, the freedom of will, and the attribution to reason of its rights to spontaneous and creative function. Not arising from spatio-temporal occasion, but being 'sui generis', itself the factor that lights up in knowledge the temporal succession, Consciousness is seen to hold a primary and supreme importance everywhere in experience. It is the precondition of all knowledge-processes, and plays an effective role in revealing all states of the psycho-physical organism, in directing the course of the will, and in seeking to exert its light over the processes and phenomena of Nature. It is acted upon by ideals which it itself may create, and through ideals and conscious energies acts upon the character of the personality, the mechanism of outer life, - thereby, in that steady developmental sequence of the self, synthesizing the intelligible and the mechanical worlds of Kant, free will and determinism, the internal free initiation and the external constraint, and uniting the conscious and the chemical, from the opposite side of naturalism. Consisting of a very limited and jarring succession of fantastically superficial assumptions, naturalism limits greatly the levels of its knowledge and is, therefore, depleted in the type of experience vouchsafed to it. It takes to the phenomenon of life, mind, and the values and their unique function and significance, a method invalid. It presents a view of nature and man inconclusive and misleading; and therefore, of necessity and by the paucity of its instruments, and the narrowness of its fields of knowledge, misses the primacy of consciousness for an adequate accounting of conation, cognition, feeling. In consequence it also has no hold on the fact that freedom is the permanent attitude and attribute of the conscious self, which, - though conditioned to some extent by the outer circumstance, - is caused, regulated, and controlled by nothing outside except by the values which it itself may have projected into some of the social institutions and personal codes of conduct. Conscious of the fine flowering in himself of the high potentialities latent in human consciousness, and inclined, under an irresistible urge, to bring mankind to a knowledge of the possibilities to which it can rise - to carry its life to a fulfilment it can attain, and to lead its activity to a purposiveness, grace, creativity, the man of richest wisdom and experience finds in Consciousness the foundation of all knowledge, the central key to the meaning of things, the 'open sesame' to the riddles of life, the delight of existence. The consciousness in man has a richness of content altogether extraordinary. From its standpoint particularly, the position of philosophical naturalism founded on the notion of the uniformity of Nature - which is itself, unfortunately for the naturalist, a fruit of mental activity - is weakest in its obscurantistic attempt to explain in terms of its petty equipment of mechanical concepts, the phenomenon of living organisms endowed as they are with capacities for conscious self-direction, for growth, for adjustment, for the exercise of choice, for the protection, preservation, and expression of self, and with such innate tendencies that seek to reach, consciously or unconsciously, some end, some purpose, some goal. This complex phenomenon is missed as having come about by the accidental groupings of molecules of matter, by the chance assemblage of inorganic elements. Naturalism accounts for the totality of human mind - distinguished as it is by unique qualities, autonomy, inventiveness, selectiveness, powers for attaining keener sensibility, higher thought, vision, insight, intuition - by laws derived from an understanding of physical and inorganic Nature - when even the organic and vital phenomena display in the restitution of function in animal bodies a standing refutation of the adequacy of mechanical explanations. Even the physical body reveals such a baffling complexity of structure and function, which cannot be accounted for unless we concede that Consciousness is prior to, resident in, and transcends, matter. Without an adequate understanding of the primacy, the priority, and the true nature of Consciousness, no science can have any secure foundation. Phenomenal successes and achievements in scientific experimentation and thought have come to disseminate on the human body a knowledge that makes it what it is - a cosmos of wonders, a restless machinery of marvels, reflecting in its complex structures and amazing processes, for the contemplative mind, the unrivalled artistry and unmistakable functions of a divine Intelligence. It constantly invites and provokes the modern temper to fresh experiments, indirect modes of tackling the problems it raises, the phenomena it presents; imperfect essays at understanding it. Yet incompletely known by science, the muscles of the physical body, too, reveal a fabulous complexity closed to all human scrutiny except to the fundamental intuitive vision, to whose direct modes of knowing things the primary and ultimate grounds of all that is are an open book. The digestive system demonstrates a chemical wizardry whose operative rudimentary intelligence and dynamic power cannot fail to astonish the inquiring individual. The tender human skin, a beauty-hide, a protective covering, with its blood-vessels that keep up normal temperature, its glands that regulate this temperature, its nerve-endings that give man his tactual experiences, its triple layer, the epidermis, the dermis and the subdermal layer, and its hundred other unique features and functions, arouse amazement. The intricacy of communications the nervous system maintains, cannot but awe even cold reason and puzzle nerve researchers with unanswered questions, left-out issues and unresolved problems. Even the common miracle of birth handicaps the most painstaking medical research person by leaving in his knowledge large lacunae. The medical science itself is much embarrassed, despite its minute knowledge of the workings of the human reproduction, by its inability to know the intrinsic how of conception. Centred in Truth-experience, the man of spiritual wisdom and keenest perception rolls his eye on the marvel of the body, resolves the marvel into Mind, the Mind into all Nature, and all Nature into the Godhead in which he lives, moves and has his conscious being. Dominant in the Western psychology, the materialistic contention that mind constitutes but a product of matter takes a standpoint that surrenders it to a logical paralogism, in that it turns its back upon a cognition of the fact that matter, far from affording an explanation of, is itself explained by mind. Entrenching itself in mechanism, metaphysical materialism, psychological automatism and environmentalism, and resolutely excluding from the field of scientific studies and rational instrumentation every phenomenon excepting the purely physical and the physiological, behaviourism coerces itself into the commitment of adumbrating that nothing mental is fundamental, that will is ineffectual, that reason has no freedom, that deliberation and design are figments, that ends have no reality, and that purposes have no efficacy. By that very entrenchment, behaviourism is further forced to assert dogmatically that no conscious intelligence superintends performance of the apparently purposeful actions, that thought never influences human behaviour, and that consciousness itself is an unneeded concept. - behaviourism thinks it has rendered psychology scientific. Behaviour, then, as behaviourism understands it, is established experimentally, demonstrably, scientifically, as the resultant of conditioned responses. In the interests of building up a true psychology, thinkers of great eminence in the fields of mental phenomena need to subject the very vitals of behaviourism to a trenchant scrutiny. 3. accept the analytical method in the domain of psychology, and thus rescue the advancement of fresh views from an infestation with arbitrary interpretations and unanalysed conceptions. 7. the assertion that perception is an integral movement. 4) affords no reasons for its position on the subsistence of the physiological structural correlates of mental configurations. To take his stand upon the principle of apperception, the principle that perceives itself and is perceived by nothing outside of itself, a principle of perception without which there can exist no such type of common human perception that constitutes the whole of the field in which lie the researches and the contributions of the Gestalt psychology, - and to poise his consciousness continuously over the timeless Vision, will always be discerned to be typical of a sage of the eminence of an evolved person who owns a mind that is less and less a mind, and more and more a centre of transcendent awareness. Such a person has, by a process of psychological self-analysis, eliminated every principle that goes to make the circumstance of finitude, the body, the mind, the soul, until at last that which is the ground of all knowledge and the ultimate basis of all experience, the eternally self-aware, self-existent, self-effulgent Reality, is reached, as the true Man, the real Person raised above mind and its limitations, mind and its everything that is the concern of psychology as also of logic, epistemology, philosophy, and mysticism. The unique and consummate development of a trend in Eastern thought, of Gestalt psychology, consists in the conception of the inner mind as knowing or receiving the object of perception by assuming its form as a whole of the subject knowing the object by an identification with it. Another feature of this uniqueness of the Eastern mode of seeing into the intrinsic 'how' and 'why' of things and phenomena, lies in branching off from the position here represented to a standpoint that asserts that this knowledge by identity obtained by the mind is but empirical, and that there is another 'knowledge by identity' of the Consciousness, - valid, real - and that alone yields us an eternally valid, real and fundamental knowledge. Preoccupied with a methodological problem, and resolutely intent on reinstating man as a psychological datum in his own right, the Allport school proceeds to attach William Mc Dougall for nomothetic assumptions, and seeks to make psychology an idiography inquiry. Reviewing the role the higher introspective observation plays in the methodological procedures of the higher psychology, as specifically opposed in function to the objective method of behaviourism and other empirical and experimental psychologies, we shall, elsewhere, expose more particularly the limitations of the grounds upon which stands the school whose presiding deity is the outstanding American authority on the psychology of personality, Gordon Willard Allport. Not so much as the substratum underlying the organized totality constituted of such psychical structures and processes as the conscious, the unconscious, and the endopsychic, but distinctively as an outgoing, diversifying, dissipating, delimiting, dividing negative force of many levels, planes, and fields of expression and activity, the spiritual psychological genius is guided by its unerring and eternally valid intuitions, to find the mind. And it approaches the mind as here presented with a hundred techniques for wresting from it its energies for downward movements, distorting activities, and disturbing experiences, and engenders in its very bosom a Power that perceives Truth wherever manifest, finds Unity in the multiplicity of things, adores a Godhead wherever it turns, - a Power for the spread of Light, for the creation of articles of Beauty, for deeds of immortal Goodness, - and, thus being itself, leaves everywhere a blessing, a benediction, a boon. This, then is the portrait of the mind our intelligence would make for itself, a portrait the fidelity of whose every little detail, every eminent Eastern philosopher, every great Western mystic, every psychologist of the supreme order, would, in light and with delight, attest. Anti-behaviouristic and anti-intellectualistic Hormic theory, as purposivism, a psychology of motivation, - a pseudo-science of instincts, - rejects psychological hedonism. It opposes psychological atomism, expounds the purposive nature of behaviour, and asserts that behavioural expressions can neither be resolved into mechanistic sequences, nor adequately explained by mechanistic concepts. It advances the thesis that all activity constitutes a conscious direction towards an objective, and that the effective determinant of all behaviour is purpose; and therefore this fact of purposiveness becomes a fundamental category of psychology furnishing an indubitable instance of teleological causation. Hormic theory finds itself accorded an encouraging support of the Eastern spiritual mind, in the explanations it embodies of experience in terms of the ends at which its efforts are supposed to aim implicitly. It finds support also in its expositions of the inadequacies of the psychological theory which refuses to regard mind in any manner save as a sheer mosaic of discrete elements, sensations and ideas, connected with one another by laws of association. But, we shall elsewhere examine the number of places whereon it stands exploded by the canons of unalterable and fundamental truths concerning the exact nature of the human mind and the central urges that ensoul it. Isomorphism postulated by pattern psychology as a principle of explanation must remain relatively unconfirmed, for the reason that the complexity and subtlety characterising the psychical process would always leave beyond accountability, the phenomenon of a percept turning into a concept. Habitually awake in the plenitude of an experience of the timeless Self, and aware of the transience of body and mind, spiritual psychology of the most profound philosophical awareness works its vision, its interest, its life into the ultimate ground of all knowing and being. The verdict of an ultramodern intelligence and a higher wisdom, in the future, we have reasons to envisage, will certainly say that through the recent centuries generations of Occidental makers of modern knowledge have rendered the whole of European and Western ethics, philosophy and psychology into an imposing and spurious complexity of dubious value, and a structure of precious mental energy directed along channels and towards aims that would never be approved by a long-disciplined, clarified, clear-eyed reason ensouling experience and wisdom. In all the three important fields, ethics, philosophy, and psychology, they have in the name of 'reason', 'reality', 'society', 'objectivity', 'science', attempted in vain to read the truths and laws of morals, soul and mind from without, within. 6. an inference from and ratiocination upon the inadequate outer evidence, for the acts and products of infallible knowledge derived from the total evidence and immediate knowledge. It would be unwise to attack, as some do, psychology from fields which do not belong to it as its proper study. Reason would neither demand from psychology an answer to the most fundamental problems of life, nor require of it an inclusion in its studies of areas which belong to parapsychology, or to fields of experience embraced by religion and spirituality, or to types of phenomena which constitute special data for other sciences. On analysis, we find that our psychological nature formed of the threads of various urges, propensities, instincts, among other things, is external to us. It is other than our true being. It is a non-essential though, empirically and pragmatically, a problematic part of real Self. Our essential being is the uninvolved, all-transcending, infinite Consciousness of absolute richness and value. Though on the surface predominantly psychological, man is essentially a supra-psychological individual. Psychological investigation and experimentation cannot yield true knowledge of man, because he is fundamentally a metaphysical subject. He is nothing without existence in him, and Existence is the first principle of metaphysics. Psychology has nothing to do with man, if man has not in him existence; without existence, there is no consciousness, and without consciousness there is no thinking, no feeling, no willing, no acting, no expression and experience. Psychology has, therefore, no field of study without these. Psychology can seek total independence of metaphysics only at its own cost and peril. Without an appreciable hold on the tree of metaphysics and spirituality, psychology is like a branch cut off which, though it looks fresh, attractive and full of life, shall soon wither, dry up and decay. Psychology has perennial and sustaining vitality for all its creative and progressive activity only by some kind of hold on the timeless, and therefore universally valid, metaphysical and spiritual insights into the essence and the most fundamental nature of the human individual. Around this all sciences are to be built. Practical daily life has no true strength, worth, nourishing essence, significance, purpose, unless it has a conscious relation to that which is the foundation of all life, Existence - which is a metaphysical category, the central theme of the Science of all sciences. Existence is inseparable from Consciousness, and Consciousness is inseparable from Existence, and Consciousness is the maker of all light, love, life, peace, joy, creative activity, progress, growth, beauty, wealth, and every blessing that the human individual seeks every day in the world. human reason and other cognate capacities of cognition. Psychology studies human behaviour; human mind is more than human behaviour. Psychology is, therefore, forced to seek to investigate the phenomenon of mind. But, there is something more in man than the mind. And here religion and psychology are interdependent and inseparable in their functions for human growth, welfare, progress, peace, happiness. For mental health and personality-integration we need not only a medically trained psychologist, but also a kind philosopher, rich in medical and psychological knowledge, and a loving culturally equipped spiritual individual. Here again, psychology and the true spirit and essential knowledge of religion are interdependent and cannot be separated without much damage to human welfare. Conscious life of the human individual cannot be orderly, noble, dignified, peaceful, joyous, when it is, as modern psychology says, determined constantly by the unconscious urges, instincts and drives. Here, then, spiritual philosophy has a role to play in presenting to the conscious mind of the human individual ideals to live by, aims to pursue, values to seek, patterns to follow; and ideals, aims, values, patterns or norms yield peace, order, beauty, harmony in life, and change the unconscious nature, forces and factors. We cannot overerestimate the value of the spiritual style of life for the peace, progress, happiness, evolution of mankind. The development of moral and spiritual nature is the solution to all human problems. Herein lies the imperishable value of a universal religion. What is mind but a subtle matter? It is a subject to change and replacement, development and degeneration, limitations and negation. It is an instrument of that which is not matter, that which is self-luminous, all-creative, all-transcendent Being. It works only when supported by the light of that which is greater than itself, the inner divine Existence, the light of the all-pure Consciousness; even as the physical eyes can perceive physical objects only when supported by the activity of the mind from within. That which is the true Self in us is the essence of all our existence and experience. We can doubt the nature of the mind, doubt the very existence of mind, doubt everything or deny everything, but not the doubter, the denier. That being which doubts or denies the mind and its functions, or psychology and its data, exists. Logically it is impossible to doubt it. It is the ultimate principle in us, and of its light the mind is born. Mind is not an indispensable instrument to it. It can act directly and function independent of the mind, whereas mind has no existence and no activity apart from it. Not to make any reference to this central, indestructible, undeniable Reality within man is to deprive the science of human behaviour of its central foundation and substance. We cannot make a science of the changing, contradictable, altering objects. Science can receive its scientific character only from its concern with the never-altering laws, whose supreme parent is the ultimate Reality within man and in the Cosmos. In his essential being man is beyond mind and its states and functions. He is a portion of the supreme Being. The enduring Essence of the self-luminous Principle in him transcends all acts and conditions of thinking, feeling, willing and acting. A condemned slave or a helpless victim of mind, man is not. He can change, alter, redirect, rule the mind. Man can master the mind, and transcend it. That principle in man which masters the mind is the inner unchanging, ever-witnessing, all-transcending Consciousness. Being interior to and above the mind, it observes the activities of the mind, and can determine the mental functions and psychological experiences in any way it may choose. With its aid, it is possible for us to dissociate ourselves from mental activities, direct them, change them, or resolve them into the Light of the all-seeing infinite Consciousness. This technique is absolutely scientific, whereas the techniques of modern psychology are subject to change and displacement, and inapplicable in many cases and with many individuals. We cannot make a science of a body of knowledge which ensouls imperfect, contradictable techniques that are invalid at certain times, in certain situations, and cannot stand the test of time. Here again psychology is compelled to befriend, in its own interests, spirituality, and seek from it more light, higher knowledge, better and more effective techniques. Mind, its experiences, its functions, its phenomena, are observable, analysable, more by the capacities resident in mind itself than by instruments and techniques perfected from without. The workings of the unconscious, the seething, dark energies beneath the conscious mind of man are not a discovery of modern psychology, but an age-old phenomenon, that has been under observation since the birth of human intelligence on earth. The saintly hearts around the world, through the millennia, have sought to transform these crude energies beneath the conscious mind, sublimated these destructive forces, controlled them and put them to positive uses, by insisting on the growth in love, in goodness, nobility, prayer, faith, devotion and development of moral and spiritual qualities. Modern Psychology has discovered nothing new. Only its approach is specialized, and its activities manysided and rewarding. One need not have to be a psychologist to know, and to manipulate, the natural phenomena subsistent in one's own being. The achievement of modern psychology consists purely in deepening, publicizing, commercializing the knowledge which has always been an integral part of the cultural heritage and the traditional attitudes, views and practices of mankind. Modern psychology has done a very distinctive service in making the formless general knowledge a well-demarcated field of investigation, research, study, science. Personality cannot be well-balanced, integrated, fully developed and rendered a source of strength, joy, value to oneself, and immensely estimable by, and useful to, the society, without pursuing such ideals which psychology has, as yet, no resource in itself to form, and which are presented by the spiritual experience, wisdom, techniques embodied in the world's great religions. Not much is found in these religions of the world that is immediately useful and relevant to the needs of modern mankind, unless the essential content in them is reinterpreted in the context of our times, and with the authority, conviction, power that come from personal spiritual growth and experience of a universal and timeless character. Modern mind does not reject the nobility, the grandeur, the appeal of the character and personality of Jesus Christ and of His messengers, or of the great spiritual individuals around the world, as models or ideals for mankind, but it cannot accept, against its own conscience, uncritically, the dead dogmas of the religions of the East or of the West. The first gift of a true spiritual life is a strong and attractive personality. Glands may truly regulate personality, but the glands themselves could be regulated, as experience discloses, by the galvanizing power of the ideals we pursue, the ideas we entertain, the feelings that we cause in ourselves. Modern psychology does recognize the need for some central Ideal in life, around and by which the personality could be organized, integrated, developed. Conduct impelled by great ideals is the secret of evolution. The psychological criterion of a dynamic, creative, happy life lies in the upliftment of the whole personal nature by active knowledge and pursuit of some noble aim, ideal, goal. The human individual is, in his essential being, the self-formulation of the infinite Consciousness. Rising in inner divine contemplative state to a higher consciousness, a great European mystic voiced the metaphysical truth that man is God in God. St. Paul declared that we live, move and have our being in God. This is the fundamental fact concerning the essential nature of the human individual. All those who have arrived at a high stage of evolution know this fact from an immediate personal experience. Declarations of the Higher Consciousness. The experiences of our physical senses and reason are contradicted, and exceeded, by the experiences of higher senses, reason and states of consciousness. To the child the earth is flat, to the grown-up ones the earth is a globe. To the common-sense view of a common, unlettered person, this earth is vast, and greater than the stars that he beholds in the firmament. But the scientific intelligence in the contemporary astronomers dismisses the world as an insignificant speck of dust in the universal system. Even so, higher states of inner Consciousness dismiss the physical encasement which man wears as significant only as an instrument and dangerous as a master. A deeper analysis discloses that our inner Consciousness is infinitely more than all that we are in our conscious and unconscious being. From this standpoint of inner experience, this evolutionary state, and this freed condition of Consciousness, mind becomes an exceedingly minor factor and loses its worth, value and significance. This non-empirical Consciousness in each human individual, called God, the Absolute, Truth, this transcendental, yet immanent Consciousness in the background, - of which the human mind knows nothing but by whose presence the human mind is enabled to operate and know things indirectly, this Being, this all-inclusive and all-accomplishing, timeless Light, has to be known, uncovered, realized and experienced. The great ones, the men of mighty intellect, of minds that are completely purged of all impurities, limitations and imperfections, of pure hearts enlivened by universal love, have had a direct experience of this infinite, illimitable, absolute Consciousness. For arriving at this high stage of evolution, and for making the numberless powers and faculties of this Consciousness our normal powers and faculties, the precondition is the complete transformation of the inferior, normal human nature. In this endeavour at a total self-transformation, in this grand evolutionary effort of liberating our own consciousness from all the impurities that blur its vision, the limitations that restrict its freedom and light, and from all those imperfections that constitute the common human nature, modern psychology renders us invaluable services. For our purpose, it is adequate to make passing references to some of the central ideas in the field of modern psychology, and see the relevance of some of these ideas to man's inner spiritual progress and God-experience. Specially in relation to the activity of self-transformation, and for purification of the normal human nature, some of the concepts of modern psychology will be remarkably useful. Since the problems of the human situation are formed by psychological experiences, a total psychological self-transformation is needed to resolve totally those problems. 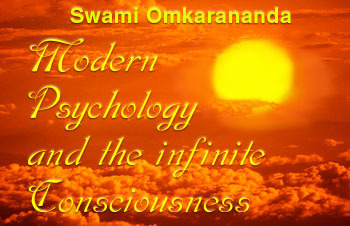 The human limitations which every man experiences in everyday life are purely psychological, and therefore a psychological self-purification, a psychological self-transformation is rendered requisite in order that we may penetrate into the Consciousness that stands as the witnessing Principle behind the mind. That Consciousness is the foundation of the identity and continuity of the individual despite the constant changes in his psychological organism. It is the I am I' in the individual who is subject to the rise and fall of thoughts, emotions, experiences. Unless we know it, we cannot alter the mind in its substance, force, light, and make it a channel for the self-expressions of the perfect Consciousness. Philosophical and moral disciplines of the human consciousness build a weak superstructure, if the aid of the psychological techniques for transformation of the unconscious are not effectively employed. Apart from the philosophical self-discipline required of our mind, apart from the disciplines in moral nature demanded of us, a group of special psychological techniques have to be effectively used if we are to make rapid progress on the path of spiritual perfection. Some of the common psychological ideas, laws, principles known to modern psychology can be most profitably employed for our development. The dark, dangerous, self-expressive psychic forces, energies, propensities, concealed in the unconscious and disclosed by psychoanalysis and other depth psychologies, have to be taken full cognizance of by an earnest seeker after divine perfection. The spiritual individual could also use some of the techniques of sublimation of the human nature, presented by some of the modern psychologists. The unchanging spiritual being of unending Light of Consciousness-Delight, is not visible to us so long as our vision is dominated by changing sense-experiences. Sense-operations are natural to the area of heavy limitations in which animals live and experience; reason, intelligence, and consciousness, which is by its very nature, light, happiness, beauty, peace, alone are normal and natural to man. Therefore, the phenomenon of the human individual is unique in the scheme of creation. Our inability to behold the grand Ground of our inner being is attributable to the constitutional incapacities of the human mind, also to the many and varied distorting and perverting forces that are released into our conscious experience by a lower unregenerate nature. Therefore, the constant endeavour of the seeker of divine perfection would consist in a vigilant elimination from his constitution of all those imperfections, impulses, urges. From one side, this activity of psychological self-examination and an increasing recognition of the varied forces and energies in our nature which stand in our way of proper perception of things, is to be kept up. Alongside this recognition, there should be an increasing awareness, knowledge, concerning the essential nature, attributes and characteristics of the underlying divine Consciousness. In order to see the Truth or God face to face, to make high inspiration and intuition a normal function of the consciousness, a normal feature of our inner nature, and to liberate the inner powers of perception from mental limitations, we are required to transfigure totally our inner psychological nature on one hand, and release into action some of the higher capacities resident in our inner mind, our inner higher and pure Consciousness, on the other hand. The object of our study requires an appropriate method, or instrument, of perception. The stars above look like tiny little things for the naked eye. The instrument of knowledge here is imperfect, and furnishes a deceptive evidence. Appropriate to the field of our study we need special telescopes and scientific instruments. Exactly so, in order that we may behold the real divine individual in man, discover and understand the underlying Consciousness which is the untouched foundation for mental activity and other conscious processes, we have to bring into operation and use the higher capacities of our inner being. We are gifted with intelligence, which is to be freed from such negative emotions as anger and hatred, such blinding urges as passion and greed, such perverting forces as pride and prejudice. Such a liberated intelligence is a luminous, blameless flame of persisting peace and joy; it is the clear-sighted seer, builder and true enjoyer. Nature has endowed us with reason in order that we may use it fully and at our best. The thinking capacity in us has to be stretched to its utmost strength. We constantly have to use our capacity to stand back, in consciousness, from the emotions and the thoughts that arise in us; and furthermore, for observing the Principle in us. We should exercise the higher functions of the higher mind in us. All this is not adequately possible unless we are to some extent morally purified. When man is completely obsessed with an idea, dominated by prejudice, overcome by passion or anger or hatred, entangled in the network of petty little affections, or completely identifies himself with his body or the external environments of his experience, he loses the dignity of a real human individual, he forfeits his rights of reason, and he is lost to God-Consciousness. It is required of us to understand the nature of the subconscious and the unconscious, and the possible hidden forces they bear. This is not adequate. We have also to obtain a true picture of our assets, our possibilities, our higher abilities and capacities. bears in its being the Supreme Reality. We take cognizance of the unconscious in us, by that which is not the unconscious. If all in us were the unconscious there would be no possibility of our observing the unconscious. If all in us were merely the conscious mental mechanisms, then there would be no possibility of our controlling the conscious mental nature and life, or exceeding their limitations. It must be admitted by every thinking individual of active reason that there is in us that ever-pure Consciousness, which transcends the world of mental phenomena. This central, all-conscious, all-luminous, self-sustaining Consciousness does not perish with the perishing body, cannot be hypnotized, or put to sleep, or rendered unconscious. It subsists in its own eternally all-perfect absoluteness. Intuitive experience reveals to us this Reality. Higher spiritual realizations, insights of the greatest geniuses of the world, perceive it as the divine Principle, as the imperishable Being, in the perishable human forms. The knowledge of this divine Consciousness is the real knowledge. Its being is our real being. Its illimitable love is our real love. Its infinite delights, powers, and wonders are our true delights, powers and wonders. The greatest men in human history who have had a glimpse of this Truth of the inner Consciousness, have dismissed the world as an insignificant nothing; and have, at least some of them, exercised their reason to its optimum strength and at its best, in order to demonstrate the powers and possibilities of the divine Consciousness behind the mind. This central supra-psychological, trans-psychic, divine Consciousness in us is the real seat of the highest perceptions of the immortal spiritual genii. It is the same in all periods of time and in all places. It is the infinity of creative Intelligence, Delight, Beauty, Love, and Perfection. It is immortal; and because of its presence in us, no man wants to die. The unmistakable effects in our outer conscious and unconscious life of the presence of the indestructible, imperishable, immortal Consciousness, are one's instinctive recoil from death, [the urge] to keep oneself in best health and prolong life, and long for immortality or deathlessness. This resistance to death in all living forms is a vague manifestation of the essential immortal nature of the inner divine Consciousness. This Reality is everywhere. It is infinite. It is absolute. It is One; and therefore there is in us a tendency to union, communion, unification. The instinct of self-multiplication, self-reproduction can be traced to some essential characteristic of the infinite Being in us. It is the unity of that Being within man, it is the infinite oneness of the Consciousness within him, that externally manifests itself in the world of time and space and physical experience as the instinct for self-reproduction. The instinct of self-preservation is a vague, dark, distorted manifestation of the self-sustaining characteristic of the infinite Consciousness within us. The endless search of man for sense-pleasures, and for all other forms of pleasures, is a distortion, a vague, dark manifestation of the infinity of delight subsistent within his inner divine Consciousness. Totally ignorant of the Kingdom of Heaven within himself, totally unaware of the divine Self and divine Consciousness of all perfection within his inner being, distressingly ignorant of the infinity of delight that is resident in his inner consciousness, tied in his mind and conscious experience to the senses and to the physical universe, he restlessly searches for happiness, pleasures, joy, outside, in physical things, and in sense-objects. And he is, for the little pleasures that are accorded him by the sense-objects and the sensuous activity, overcome by surfeit, nervous exhaustion, inefficiency, disease and death. All those tendencies in us which are human and belong to the lower psychological nature, need to be sublimated and transformed. The ground of our conscious experience, and the unconscious and the subconscious determinants of the conscious behaviour, could be cleared out. Every impulse of our inferior nature can be sublimated. As we grow in moral stature, govern and guide our instincts, impulses, urges by reason, give new directions to our energies, and live by a higher scale of values and ideals, we slowly begin to qualify ourselves to rule the mind, and not be ruled by the mind. At this stage, as the higher powers and capacities of the inner being come into exceedingly increasing action, we are restored to our essential dignity. We begin to see that love in our heart would be given its infinitude. The limitations of the mind could be transcended. The essential activity of the inner divine Consciousness could be made the normal activity of our conscious being. Our desire, impulse, aspiration for perfection finds more firm grounds, and is given its fulfilment. The human individual, as he subsists on earth, is a riddle, a problem, because the infinite Consciousness, the divine Principle in him is totally forgotten and man is powerfully governed by the lower tendencies of the common unconscious and conscious human nature. Man as he is outwardly, a physical being, seems to be a being of lower instincts and impulses, entrapped in ugly limitations, relieved now and then by a little active thought; only rarely and occasionally lit up by something sensible, some noble objective. This is true only of the outer superficial aspects of man. As we divest man of his physical encasement, the psychological trappings, and the inner psychic entity which carries in itself all the residual potencies and the determining causes and forces of his outer conscious personality, we touch in him the essential divine Consciousness, the fundamental divine Principle, which is one, illimitable, timeless, all-witnessing, all-creative, all-beautiful, all-containing, self-sustaining. It is this Being that is called the Kingdom of Heaven. A conscious experience of it in our daily life, should be our immediate objective and aim. In any case, it is our inevitable destiny. Our education and our psychology should assist us in stripping off, or eliminating, the crude human elements, in refining, elevating and transforming everything within ourselves, and aiding us to manifest higher powers. This path of spiritual progress and evolution is an adventurous and exciting path, demanding from the human individual a rare strength of will. It requires of him control of himself, and to use the environment he lives in for purposes of inward growth and development. It is a path that calls for constant exercise of reason. It is the way by which the human intelligence embraces the universal all-pervading Consciousness and is lit up by its Light. If it is not the developed reason that calls us to these heights of evolutionary perfection awaiting us, at least the very fact of the sad incidents and sorrows of a limited human life will persuade, coerce and force us to move in this direction. The earlier we recognize the truth that God is the central Consciousness of our inner being, that He is the very substance of our inner life, and that our salvation in daily life lies in our conscious awareness of Him, the better. The extent of our real and lasting peace and happiness, the power of our goodness and the all-inclusiveness of our love, the extent to which we are wise, and the extent to which our life is fruitful, rich, and throbbing with delight, rest upon the extent to which we are conscious of God or the Infinite in our daily lives.